When picking a beauty product, what do you look for? Maybe you look for active ingredients that can help you achieve the glow you want. I, for one, don’t go as far as Google-ing what Dimethicone/vinyl Dimenticone Crosspolymer or Phenoxyethaqnol is once I see that a moisturizer, for example, has hyaluronic acid. But has it ever occurred to you that your go-to items may contain potentially harmful chemicals? It’s easy to get caught up with all the highfalutin words listed on the label, and that’s disregarding the fact that some manufacturers rarely fully disclose the contents of their product. In an age of misinformation and when beauty trends strategically packaged as “self-care” actually trump safety, how do you make sure the creams, lotions, serums, toners, scrubs, and whatnot that you put in your face are actually safe? The Environmental Working Group (EWG)’s Skin Deep Cosmetic database is an online repository of safety ratings for more than 78,000 cosmetics and other personal care products. Since 2004, this initiative has logged over 2,500 brands and assessed the hazards its ingredients pose. A quick search, for example, of my officemate’s moisturizing serum formulated by a Korean skincare brand shows its ingredients and whether they’re health threatening based on a hazard score (1 to 2 is low hazard, 3 to 6 is moderate hazard, 7 to 10 is high hazard). It also shows the robustness of the literature about a particular product or ingredient. 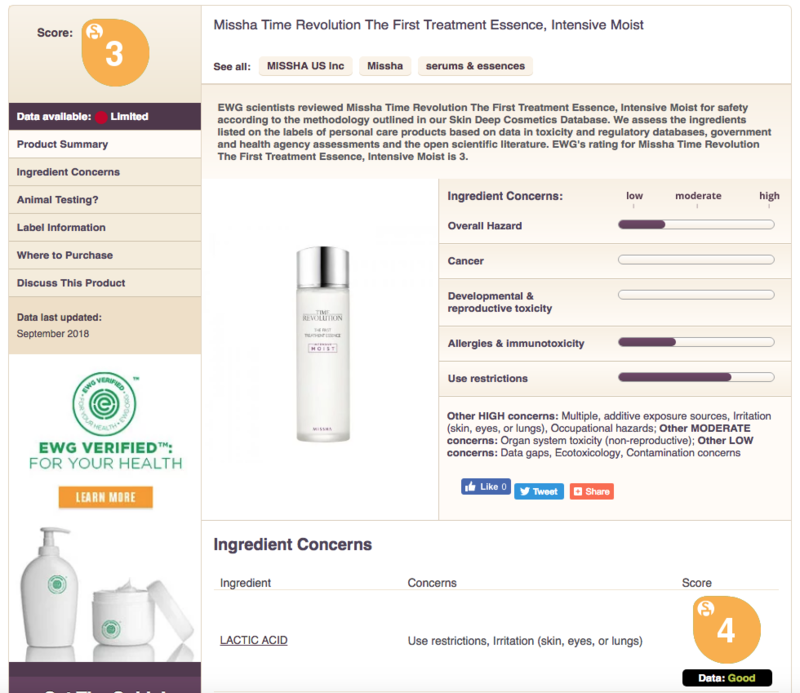 After assessing every ingredient based on data in toxicity and regulatory databases, government and health agency assessments, and the open scientific literature, EWG’s rating for Missha Time Revolution The First Treatment Essence, Intensive Moist is 3. A break down of the ingredients can also be viewed. And as for my officemate’s serum, lactic acid is the primary concern along with phenoxyethanol that can both cause irritation in the eyes, skin, and lungs. But since EWG is ultimately focused on brands in the US market, you may find that not all beauty products are listed, especially Philippine-made ones. Human Nature, for example, a local brand of personal care products who prides itself in using on naturally-derived ingredients, is not on the Skin Deep list. 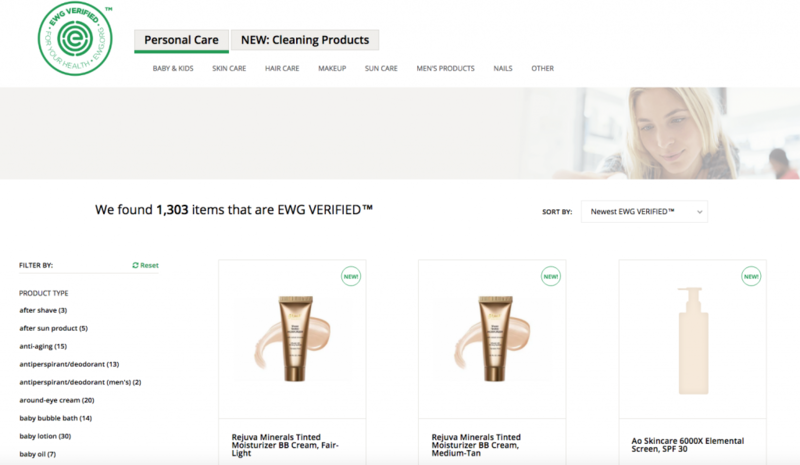 For other necessities, which don’t fall under the skincare category, they have the EWG Verified database which recognizes cleaning, baby, and household articles that abide by their safety requirements by using only certified safe chemicals and components. The non-profit, non-partisan organization is also known for their other consumer guides like its annual list of “Dirty Dozen” that ranks which fruits and vegetables have the highest pesticide content in the market. For 2019, their top five includes strawberries, spinach, kale, nectarines, and apples. Like most definitive lists, EWG’s has a fair share of criticism. A Slate article dated January 2014, criticized the organization’s methods saying the experts they consulted were concerned that it was flawed. “Among other things, the non-profit group does not compare actual pesticide levels on fruits and vegetables to the EPA’s exposure limits to estimate true health effects of consumption,” reads the article. A Forbes contributor in 2016 wrote about how organizations like EWG help market perceived safer alternatives through manufacturing fear. In the end, it’s really up to us to put two and two together. After all, there’s a reason why Google exists. If we can spend hours reading tons of reviews and recommendations on the best skincare products that avoid breakouts, we sure could spare a minute to check if their ingredients are actually safe.